Find the best costumes for Halloween, Christmas or any holiday party. Reindeers are the famous flying Christmas animal that tows Santa’s sleigh through the air and around the world every Christmas eve delivering presents to boys and girls. Eight reindeer towed his sled. The most famous reindeer is Rudolph the red nose reindeer. But there were others Dasher, Dancer, Prancer, Vixen, Comet, Cupid, Donner and Blixen. You can dress up as the famous reindeer or create a whole team with a Santa guiding them around the house or neighbourhood. The reindeer costume is a perfect match with Santa, elves, Christmas tree, snowman and more. Click here for more Christmas costume ideas. Below are costume ideas for Rudolph Reindeer costume plus his other reindeer pals, remember you need 8 of them to complete the team. Make everyone at the holiday party smile when you walk in wearing this Inflatable Christmas Reindeer Costume. This inflatable costume is designed to look like a reindeer with a red nose wearing a Santa hat. 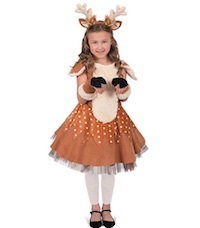 The brown feet complete this cute deer costume. The battery operated built-in fan inflates the costume within seconds, and the face hole and hand openings allow you to enjoy the snacks at the party. You’ll be ready to lead Santa’s sleigh wearing this reindeer costume! This fun Christmas costume is perfect for holiday parties and family pictures. Prance into the party in this Inflatable Reindeer Costume, and everyone will notice you. 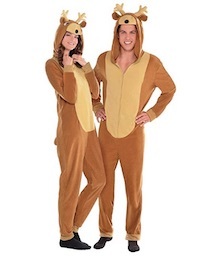 Just slip on the jumpsuit, turn on the fan, and watch the reindeer costume inflate in seconds. 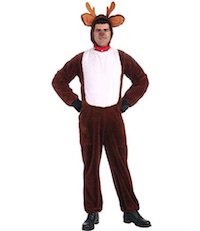 This reindeer jumpsuit features a brown body and a hood with big eyes and inflatable antlers. This is a perfect costume idea for office parties, school celebrations, holiday parties and trick-or-treating. 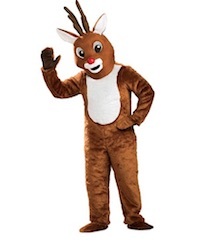 Pair this inflatable deer costume with black shoes, gloves and face paint (sold separately) for a unique deer outfit. Batteries not included. 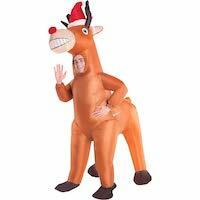 Click here to get Inflatable Christmas Rudolph Costume for Adults. Prance into the party in this Zipster Reindeer One Piece Costume featuring an oversized hood which looks just like a reindeer face, with eyes, nose, ears and plush antlers. Stay comfy and snuggly warm in this zip-front jumpsuit with stretch wrist and ankle cuffs that keep the cold out! Pair this outfit with face paint and dark shoes (sold separately) to complete the perfect deer look. A front zipper allows you to quickly take it off. Be sure to machine wash cold inside out and tumble dry low after you’ve had a fun night of celebrating! Plush reindeer costume jumpsuit features red jingle bell collar and hood with antlers. Click here to get the Plush Christmas Rudolph Reindeer Costume. Includes brown dress with white spots. Brown Toole under skirt. Head piece has deer ears and antlers. If you’re looking for a great Christmas present or fancy dress outfit, look no further! Our Ride Me Costume is made from 100% quality soft polyester that fits well and feels great to wear. You’ll be the life and soul of the party with hilarious results. Perfect for fancy dress parties and dress up, you’ll definitely make a memorable impression. And the photos will prove it! 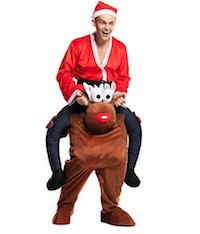 Click here to get Inflatable Santa Riding Rudolph Costume. Everyone needs a reindeer mascot! Now’s your chance with this deluxe mascot costume from rubies. 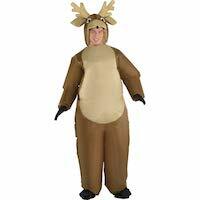 Click here to get Deluxe Christmas Rudolph Reindeer Costume. You’re welcome to link to New-Costumes.com or use a single image with a brief description to link back to any post. Republishing posts in their entirety is prohibited. Feel free to pin on Pinterest! New-Costumes.com is a participant in the Amazon Services LLC Associates Program, an affiliate advertising program designed to provide a means for sites to earn advertising fees by advertising and linking to Amazon.com.